I have to thank my wonderful professional baking buddy Angie for this one -she lent her spring form pan last minute. And I'm so glad she did, because this cheesecake was super yummy. My daughter spotted it in my latest issue of Everyday Food, and insisted we try it. 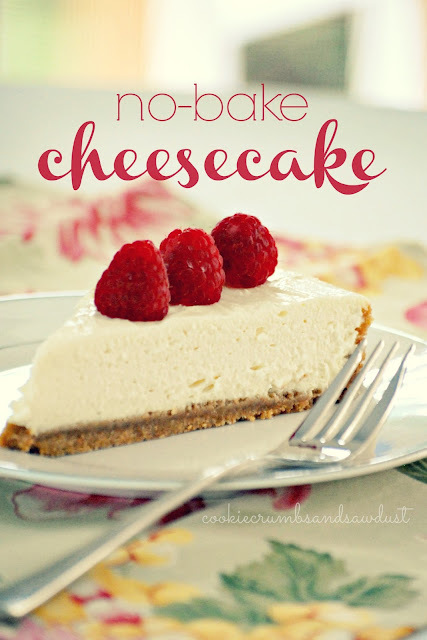 Unlike the baked variety, this cheesecake chills in the fridge to set up, giving it a light, mousse-like consistency perfect for summer! In a food processor, pulse graham crackers until finely ground (you should have about 2 cups). Add butter, 2 tablespoons granulated sugar, and 1/4 teaspoon salt; pulse until combined. Press crumbs evenly onto the bottom and 1 inch up the sides of a 9-inch springform pan. In a large bowl and using an electric mixer on high, beat cream cheese until fluffy, 3 minutes. Add confectioners' sugar, yogurt, vanilla, and a pinch of salt; beat until smooth. With a rubber spatula, fold in whipped cream. Pour cream cheese mixture into crust and smooth top. Cover and refrigerate until firm, at least 8 hours (or overnight). The recipe recommended using a flat bottomed measuring cup to pressure the graham cracker crumbs into the pan. I did and it worked great! The crumbs easily went up the sides and evenly spread out on the bottom crust. This looks heavenly. I want that piece right now!! I have to make this! Pinning to try soon - thanks so much for sharing! oh, I must try this recipe- perfect! !